Jamaica's Hottest New-School Reggae Artists Return To Roots A new generation wants to dominate Jamaica's music scene with a fresh take on an old-school sound. NPR's Baz Dreisinger looks further into the musical resurgence and the artists leading the charge. 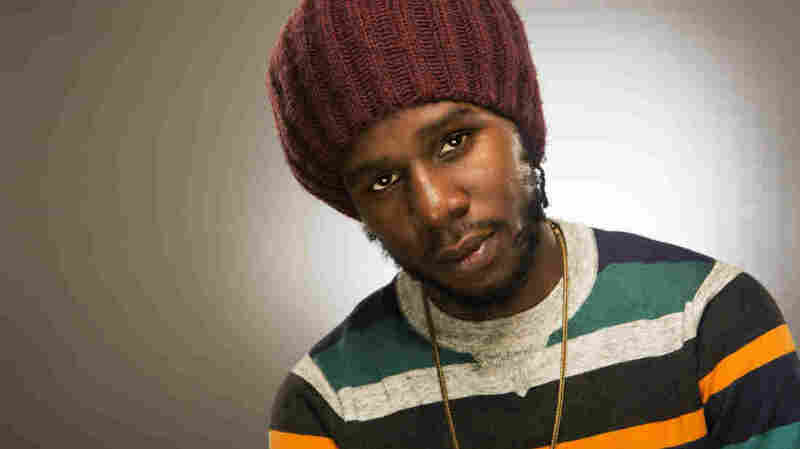 Chronixx is one of the biggest new artists in reggae, as well as part of a younger generation of Jamaican musicians who give old-school sounds a fresh take. Live bands. Soulful music. Substantive lyrics. I could be describing the Jamaican music scene circa 1976, the heyday of Bob Marley. But I'm talking about a sound that dominated at this year's Reggae Sumfest, Jamaica's biggest annual music festival. Jamaican artist Chronixx, 20, performed live before nearly 10,000 fans at the yearly event. He's Jamaica's most buzzed-about artist right now, and he's leading the way in a rich musical movement: new-school roots. It's a bit of Rasta meets hipster. Chronixx says it's a repackaging of what came before. "We are not going to do it like Bob Marley did or like Burning Spear did," Chronixx says. "We are using their blueprint to bring on a new generation of works." It's a sound that's been in his ears since he was a kid. His father was a successful musician who went by the name Chronicle. Chronixx began writing songs at age 6 and started producing as a teenager. He says he went to "reggae school," which he compares to the rigorous demands of medical school. "It's just like, before you go out there and do a surgery on a human being, you have to learn medicine, biology, chemistry — all the things you need to be a doctor," Chronixx says. "And in reality, artists don't do much different from doctors; they heal people. So you have to learn your craft good. It's a science. You have to learn the history." While "Know Thy History" is an unspoken commandment of the new roots movement, it's not just about creating a musical carbon copy of the past — though the fashion sense of these artists definitely screams 1970s. Take new roots artist Protoje: He describes the style of his 2013 sophomore album, The 8 Year Affair, as a blend of traditional roots-reggae, modern-day rock and hip-hop. "The first song I ever knew word-for-word was Slick Rick, 'Children's Story.' When I heard Slick Rick — that type of flow — I was like, 'Yo, it's so cool!' I didn't hear stuff like that. So I kind of started to pattern my style." Protoje wrote a song called "Kingston Be Wise" about the so-called "Tivoli Massacre" of 2010, when 76 civilians were killed by Jamaican police and military forces, who were scouring Kingston for alleged drug lord Christopher Coke. "I sat on the top of the skyline and watched the city burn that day," Protoje says. "So I wrote about that to say, 'Be wise in these times, and understand there's a lot of geopolitics at play.'" This message suggests another commandment of the current movement: Write your own songs and have something to say. Kumar Bent, lead singer of the band Raging Fyah, says that's what the new roots scene is about. "This movement now that's happening is a revival of consciousness," Bent says. "It's not about singing about a girl's skirt anymore; it's about upliftment of the mind." Add two more tacit rules of the scene: First, don't beef — collaborate. Artists like Chronixx, Protoje and Raging Fyah form a kind of collective, performing and recording together all the time. And last but not least: Go live. Chronixx plays keyboards, drums and guitar, while Raging Fyah delivers the ultimate live show. Protoje, who only records live in the studio, says this return to bands places Jamaican acts on par with American reggae bands like SOJA and The Green, who have come to rival the island's musicians in popularity. "We're ready to go back out there and play reggae music alongside these bands, and show that the authentic sound is still Jamaican," Protoje says. "Reggae music was born and bred here, and we're ready to show that we're here to continue on that tradition." It's a tradition that, however many times it's remixed and repackaged, never seems to get old.